According to the official government of the Navajo People, ” The Navajo Nation extends into the states of Utah , Arizona and New Mexico , covering over 27,000 square miles of unparalleled beauty. 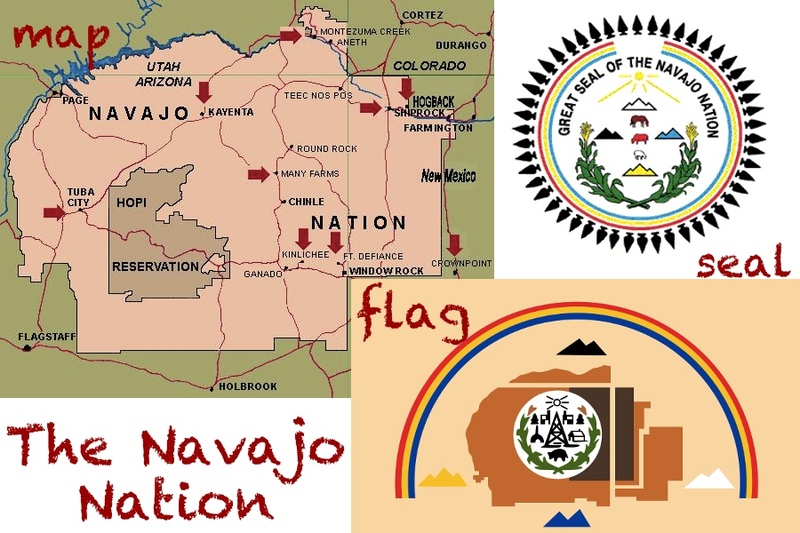 Diné Bikéyah, or Navajoland, is larger than 10 of the 50 states in America…Today, the Navajo Nation is striving to sustain a viable economy for an ever increasing population that now surpasses 250,000.” The Navajo Peoples have their own language, referred to as Navajo or Navaho, and whose native name is Diné bizaad. Navajo Art encompasses several well known forms – woven blankets, turquoise jewelry, navajo patterned items, and ceramics. Because of impostors, any item produced after 1935 that is marketed using terms such as “Indian,” “Native American” or “Alaska Native” must be made by a member of a State or federally-recognized tribe or acertified Indian artisan. Navajo People’s oral tales tell us they learned to weave from Spider Woman and that the first loom was of sky and earth cords, with weaving tools of sunlight, lightning, white shell, and crystal. 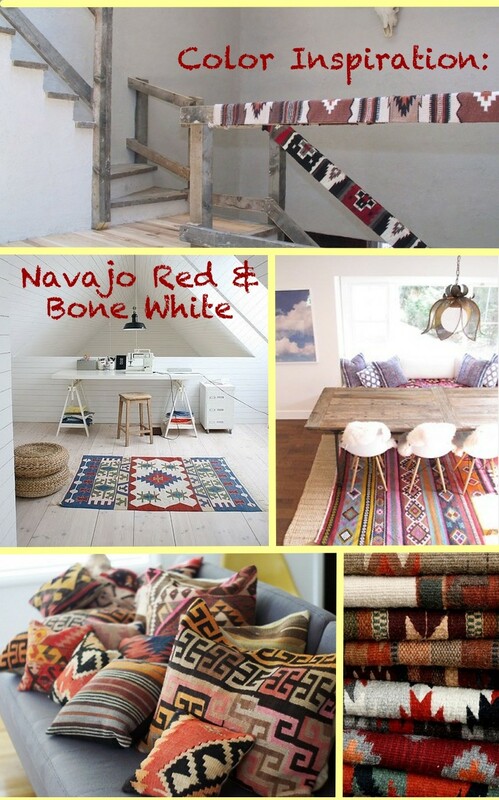 It is said that Navajo Rugs and Textiles mirror the social and economic history of Navajo people. Navajo women wove their experiences and life lessons into the pieces they created, thus each pattern is said to be wholly unique and personal. Weavings were used to create shoulder robes, hair ties, belts, dresses, and blankets. Personal adornment and jewelry found in the southwestern area consisting of Arizona and New Mexico is thought to date back to the first half of the 1st millennium AD and was mostly seen in bracelets made from a shells, simple stones, and fibers. Silver did not become available through trade, or an important status symbol, until the 1800’s. According to Bruce Bernstein, former director, Museum of Indian Arts and Culture, Museum of New Mexico, Santa Fe, “For more than a century, the products of Navajo looms were probably identical to those of their Pueblo teachers, but by the end of the 1700s Navajo weaving began its divergence. While Pueblo weavers remained conservative, Navajo weavers learned that wefts did not need to be passed through all the warps each time, but rather, by stopping at whatever point they wished they could create patterning other than horizontal bands.” The weavings continued to change with Spanish influences, the introduction of cotton (which easily replaced wool), and ink dyes. Specific colors are often attributed to Navajo designs, so much so that the term “Navajo White” actually refers to the orange, white, almost bone tinted color seen in the Navajo flag (above). There are four sacred colors in the Navajo religion: blue-turquoise, white-white shell, black-jet, and yellow-abalone. To me, the traditional Navajo designs are able to seamlessly integrate with the desert nature of the region, often confusing colors in rugs with that of a desolate sunset over caked sands. 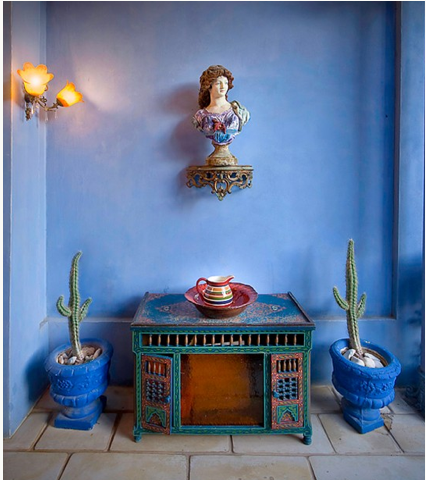 The colors of the artisans are that of cactus flowers, skies, and animal bones. This obvious organic influence is a beautiful way to pay homage to nature, even when one is trapped in an urban, concrete jungle (I think I can count ONE tree out of my window). The antique, original, Navajo Black and White Photos can be found HERE and in the collection of the National Museum of the American Indian HERE. If you want to support Navajo artisans directly, make sure your products are marked with an official stamp, or purchase items directly from GoNavajo.com. 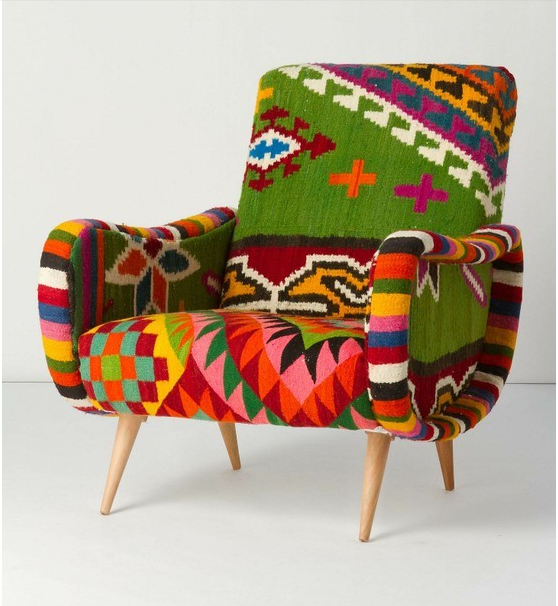 Navajo Inspired Print Chair from Anthropologie. 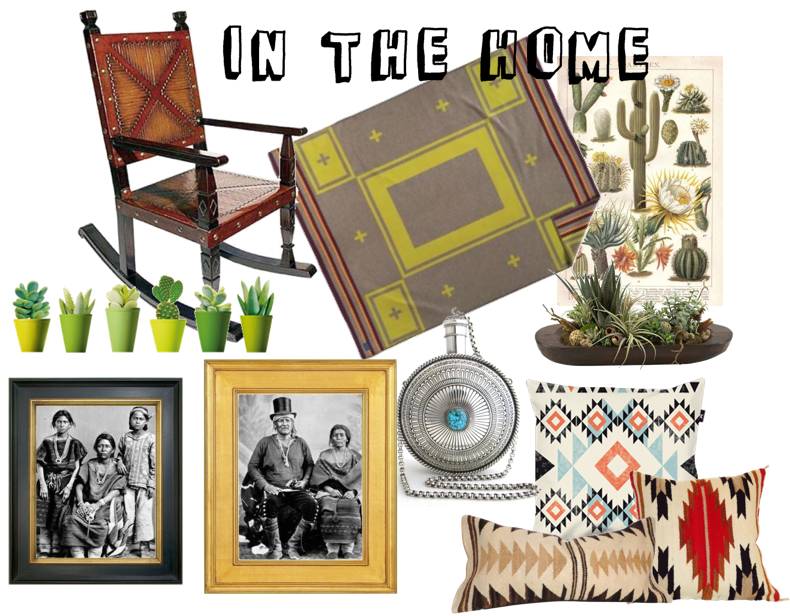 Navajo Inspired Room Details from Design*Sponge. 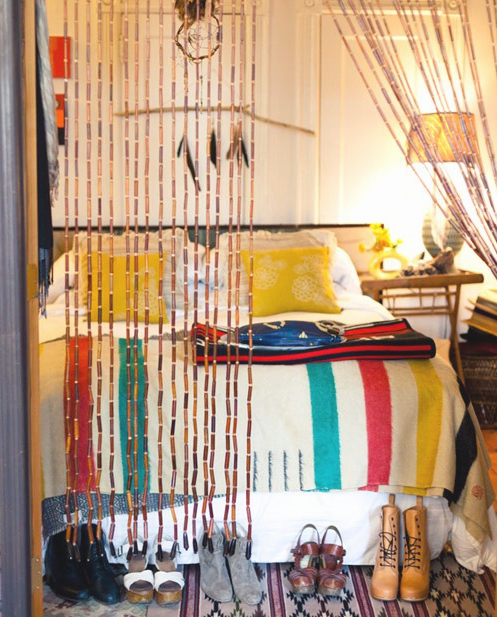 A Pueblo meets Navajo meets Roman Greco meets Versaille corner courtesy of Houzz. Loving the mixed metaphors! 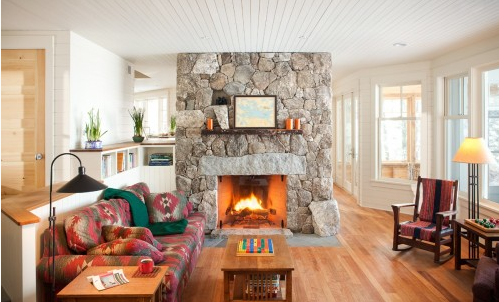 Navajo Inspired Living Room also from Houzz. 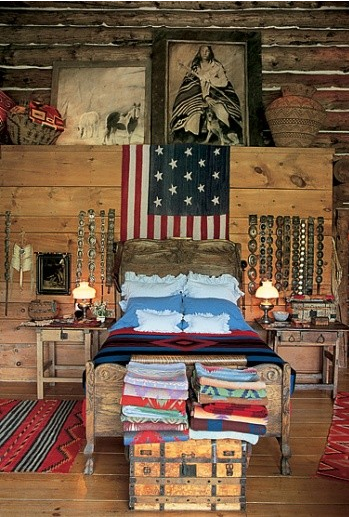 Mock Trading Post / Oregon Trail Fort Decor from Habitually Chic. 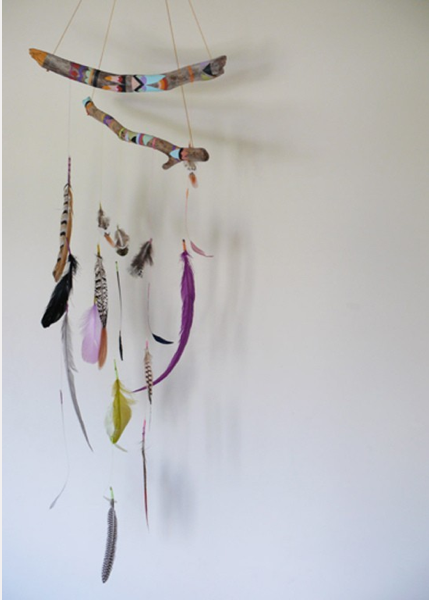 Navajo Inspired Mobile from Thoughtful Day. I leave you with “goodbye” in Navajo! Hágoónee’!